I dated a racist bully. No. This is not how he introduced himself to me. He seduced/introduced himself to me with his good looks, wicked sense of humor, and powerful stride that charmed the pants off me while taking my breath away. It wasn’t until I was locked and loaded (in love) that I discovered he was proud to be associated with the KKK. I remember how his body would shake when we would see a black man walking by us on the street. He would say hateful things under his breath, but he was the one shaking…he was the one who was scared. Yes. This tall, dark, handsome, privileged, Caucasian, Christian man/boy was the one who felt like the scared little bunny rabbit in the woods, looking up furtively at a huge slobbering grizzly bear. His fear (terror) justified his bigotry and hatred. He felt like the victim. It never occurred to him that the black man he was passing in the street was the one terrified of him (and for good reason). What about the White Christians? 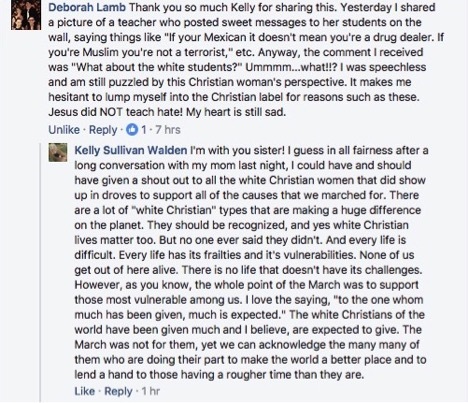 White Christians don’t need a march. White Christians already have a place at the table and red-carpet invitation to the party. In fact, the party is for them…and has always been for them. 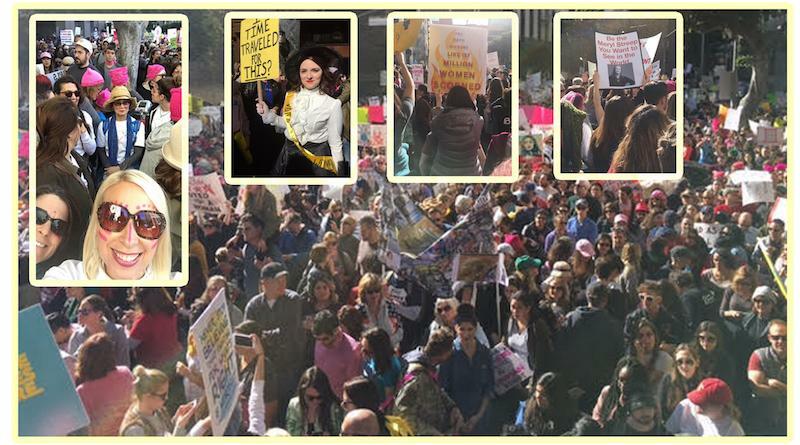 I marched for the ones who had not been invited to the party. I marched for the ones who had never been invited to the party. 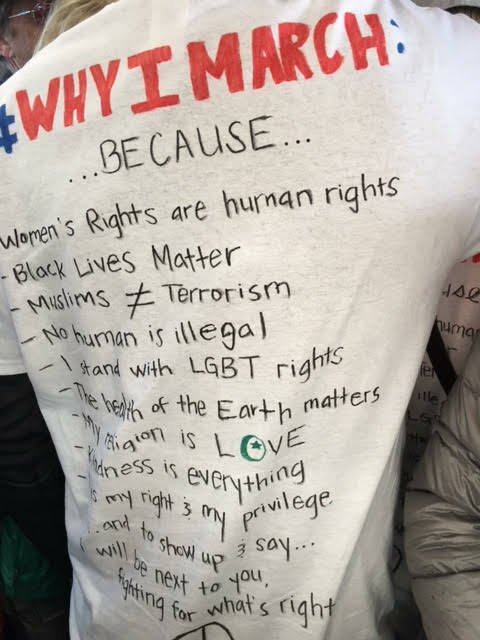 I marched for the ones who- if they showed up at the party would (at best) be escorted out through the back door and sternly advised not to bother showing up again…for if they did, they’d be forced to pay the price for daring to assume they had the same rights as White Christians. So, no, it didn’t occur to me to march for the White Christians of the world-even though I technically am one of them (although my “Christianity” is of, what I’m sure, a far more liberal variety than yours). I think about this a lot. And when I think about it I would imagine Jesus (the one I pray to) would have joined the march-or maybe would have led it. And when it was over he would have washed the feet of the people who had been bullied for far too long by bullies who thought they were victims of people who look differently than them. But, I digress. You asked about Christians, not Jesus. I believe there can be quite a difference between the two-I mean, Jesus wasn’t technically a Christian, just like Buddha wasn’t technically a Buddhist, nor was Mohamad technically a Muslim. I’m glad I checked the text before sending! It might have caused some serious confusion! Ok, that would have been waaaay too long of a sign…maybe a scroll…but not a sign. Ok, back to dreams…I am Doctor Dream, after all. In dream work we are taught (nod to Carl Jung) to see everyone and everything as if it were us (or at least an aspect of ourselves). Which means that this whole conversation is a nudge for me (thank you) to look more deeply into the mirror- to face and embrace the protest march within myself that consists of my own inner bully, victim, and White Christian. May the healing and alchemy that happens within, have its effects in the world without. I wish I’d kept them up for you to see (because you may not believe someone could respond like that…or maybe you can). I think I’ll keep all comments on my page…I do support free speech and all….even if that speech is drenched in ignorance.